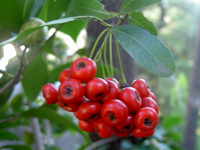 学名 Pyracantha coccinea (L.) Roem. 学名 Pyracantha crenulata (Roxb.) Roem. (c)2006-2008 A Pretty Garden ALL Rights Reserved.